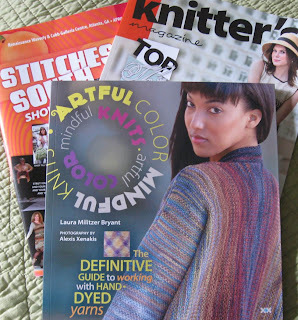 "Artful Color, Mindful Knits" by Laura Bryant. Stitches South 2013 was a fabulous show once again... with lots of buzz about new techniques, the latest knitwear fashions, tools, fibers, yarns and more. 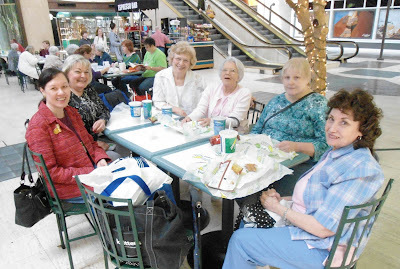 I attended classes with world-renown knitting gurus Lily Chin, Anna Zilboorg and Rick Mondragon, did my due diligence at the vendor mall (sigh! ), and breathed in enough inspiration to make one's head spin. This year, I decided to attend the Pajama Party (10 pm to midnight) where knitters, crocheters (and a few spinners) came in their PJs, fuzzy bunny slippers and curlers. PJ Party-goers toted their yarny WIPs (work in progress) along with miscellaneous and sundry items for the "Let's Make a Deal" games and antics—knitter's style. It was a blast and winners won some great prizes! A few of my knitting students and I having lunch at Stitches South. 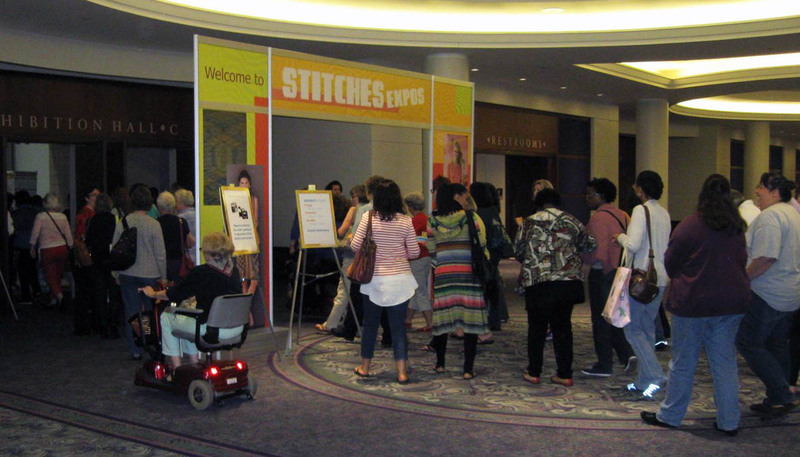 Back at the vendor mall... XRX, the publisher of Knitter's Magazine and numerous knitting books, and the sponsor of the Stitches expos, always has a booth up front. 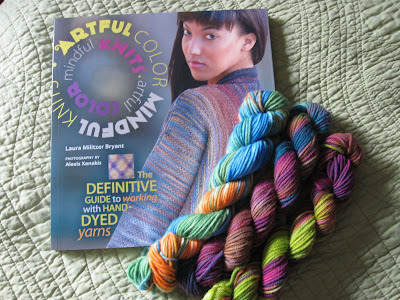 This year, the XRX booth was spotlighting "Artful Color, Mindful Knits: The Definitive Guide to Working with Hand-dyed Yarn" by Laura Militzer Bryant. Laura Bryant's new book, "Artful Color, Mindful Knits." For those that may not know Laura, she is the creative master mind and founder of Prism Yarns and has been hand-dying yarn for 30+ years. A brief demo at the XRX booth on Laura's "Magic Number" concept for using hand-dyed yarns to achieve amazing (and controlled) patterns immediately sold me on the book. (You should have seen the swatches and the garments... OMGosh!) I took a class with Laura 2 years ago at Stitches South, so was familiar with her vast expertise and stunning knitwear designs using hand-dyed yarn. Her book tops this! 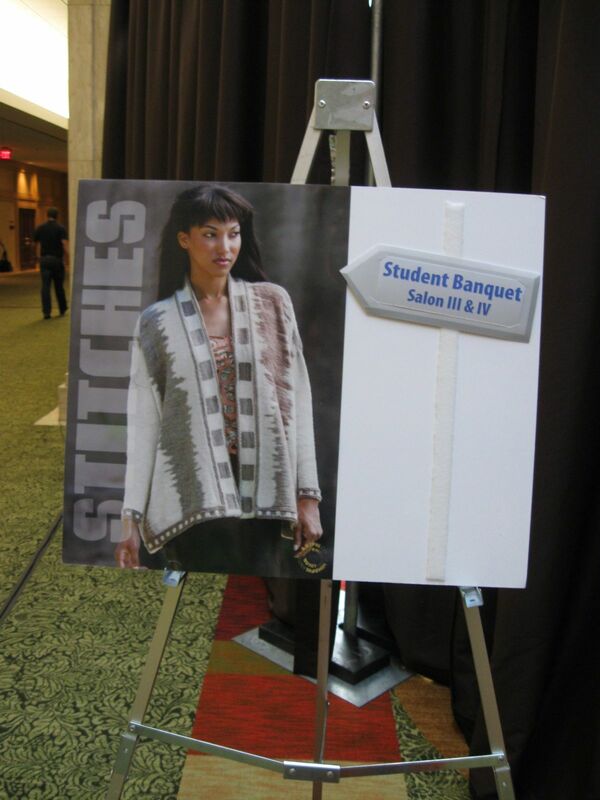 Poster showing one of the Artful Color garments. 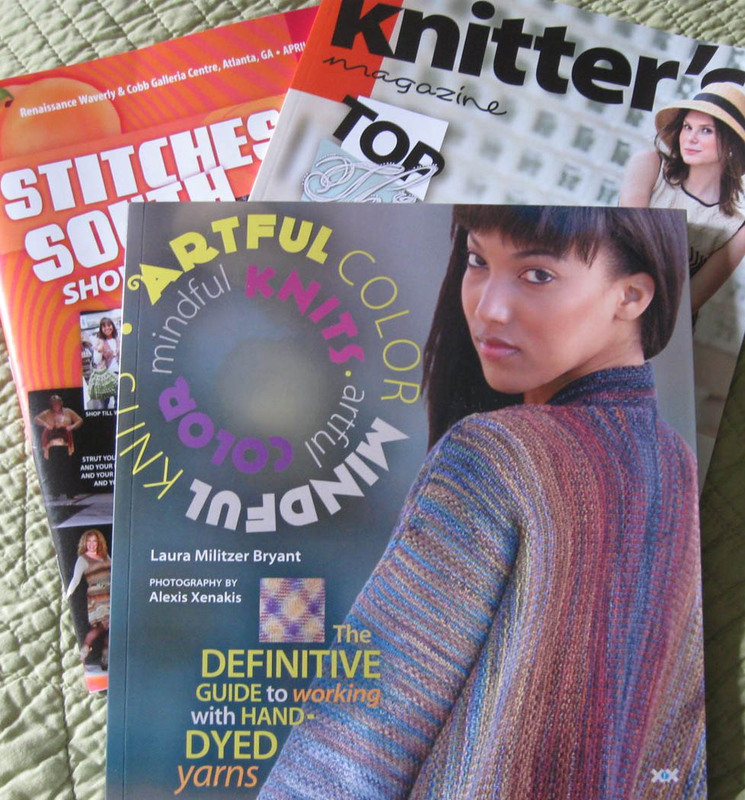 I haven't digested all the info in the book, but this is a resource every knitter and crocheter should have on her/his bookshelf. It will serve you well as a reference now and for years to come. The dash into the vendor mall preview for pre-paid attendees. So, run! Order Artful Color, Mindful Knits: The Definitive Guide to Working with Hand-dyed Yarn for yourself now!